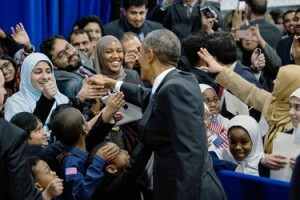 President Obama reached out to Muslims in the United States on Wednesday in an impassioned speech, embracing them as part of “one American family,” implicitly criticizing the Republican presidential candidates and warning citizens not to be “bystanders to bigotry.’’ In a visit to the Islamic Society of Baltimore, his first to a mosque in the United States as president, Mr. Obama recited phrases from the Quran and he praised American Muslims as a crucial part of America’s history and vital to the nation’s future. “If we’re serious about freedom of religion — and I’m talking to my fellow Christians who are the majority in this country — we have to understand that an attack on one faith is an attack on all faiths,” he said. Although Mr. Obama never mentioned Republican presidential candidates like Donald J. Trump and Ben Carson, the targets of his remarks were clear. “We have to reject a politics that seeks to manipulate bigotry,” Mr. Obama said. But he said that too many Americans only heard about Islam after terrorist attacks, and that this must change. “Our television shows should have some Muslim characters that are unrelated to national security,” he said. “It’s not that hard to do. There was a time when there was no black people on television.” Mr. Obama said that anyone who suggested that the United States was at war with Islam not only legitimized such groups as the Islamic State but also played into their hands. “That kind of mind-set helps our enemies,” he said. “It helps our enemies recruit. It makes us all less safe.” For Mr. Obama, the remarks were an implicit admission of how little progress has been made since he opened his presidency with a 2009 speech he delivered in Cairo that sought to reach out to the world’s Muslims by calling for “a sustained effort to listen to each other, to learn from each other, to respect one another, and to seek common ground.” Seven years after the Cairo address, which the White House titled, “A New Beginning,” Mr. Obama is nearing the end of his presidency at a time when respect and common ground have often been overtaken by suspicion and angry political rhetoric.